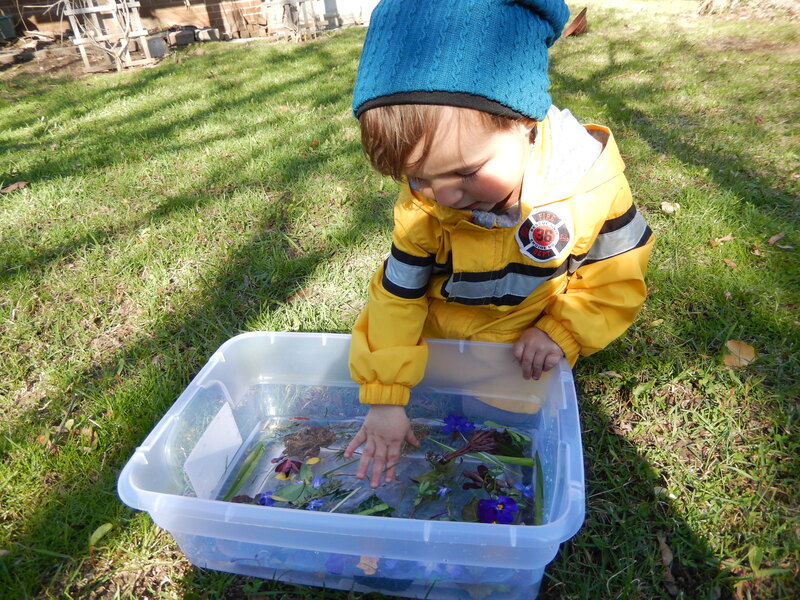 What To Do With A Water Table? 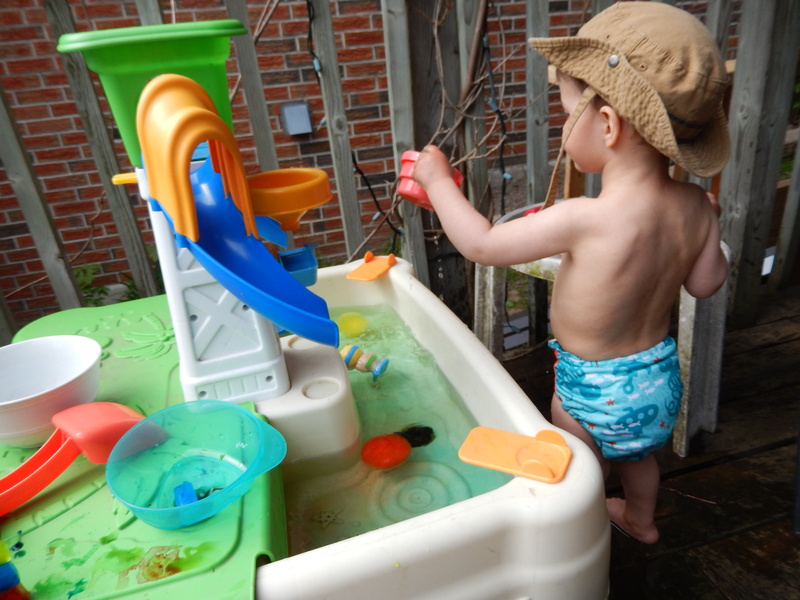 As always we are always looking for fun new toddler activities to do, and this week I pulled out the water table and (after a good scrubbing with a magic eraser) it was ready for some time to shine! 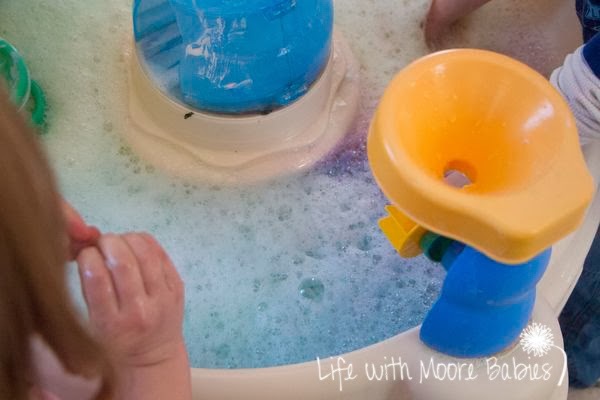 I went searching for some inspiration for some unexpected ways to play with our splash works and thanks to my fellow bloggers I was not disappointed! 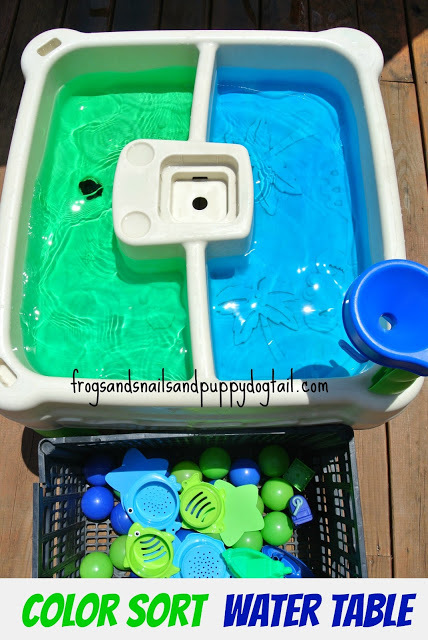 The weather is getting warmer, so here are some fun ways to cool down while making the most out of your water table! I thought this was the coolest idea! 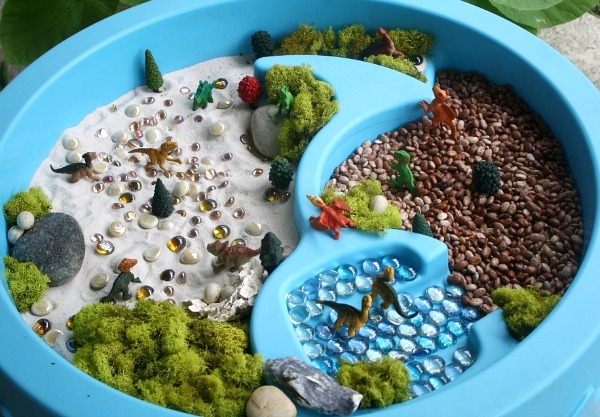 Make a fun for kids dinosaur mini world right there in your water table! 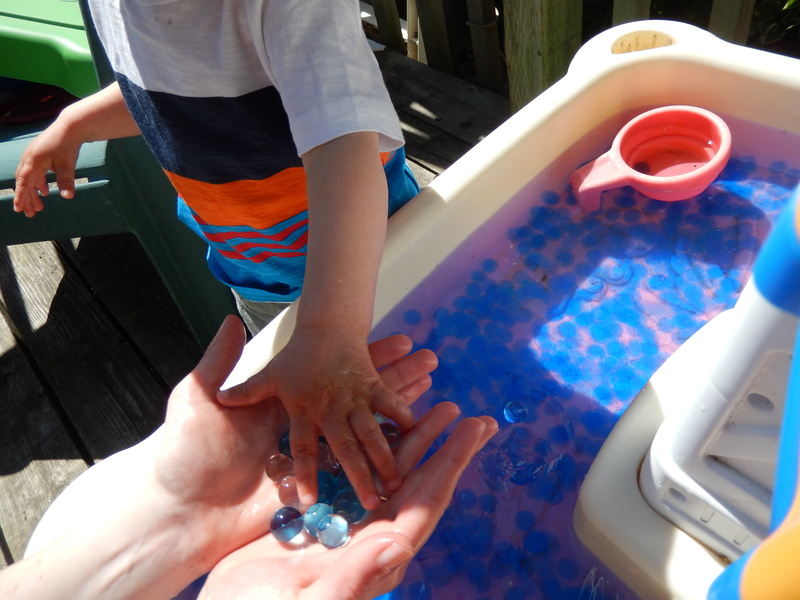 Why not fill it up with these slippery little balls, a neat sensory experience for your little ones, my son loves this! I sounds odd but I myself find running my fingers through these to be so relaxing, I even had a dream that we filled a pool up with them and it was glorious! Keep in mind that they can be a choking hazard so keep them away from small children or those you worry will put them in their mouth. Always supervise when using water beads! Who didn’t love bubble baths as a kid? 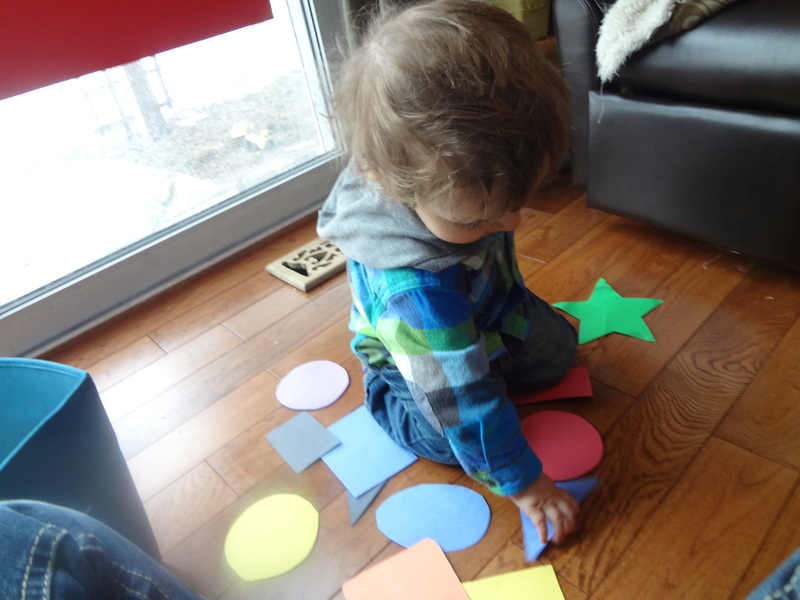 So why not bring the foam (and colourful to boot) to the water table! 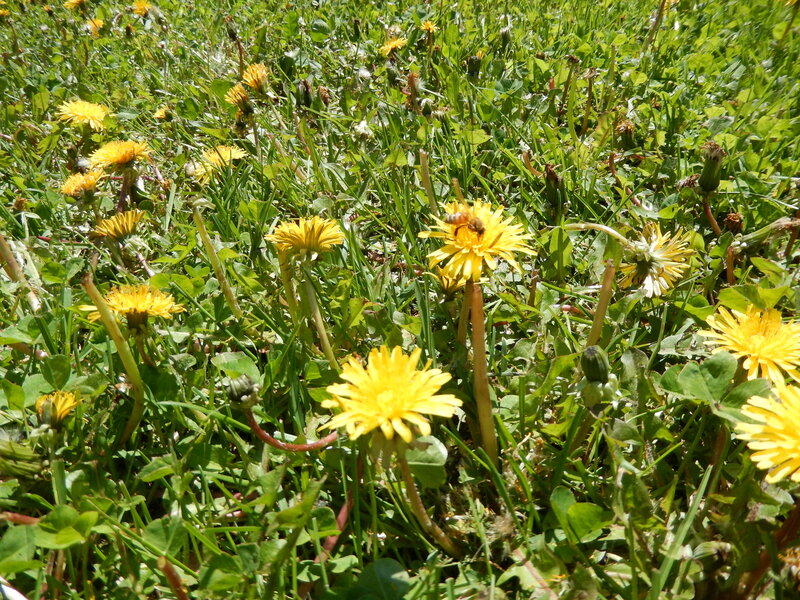 It is spring, the dandelions are plentiful, why not?! It is getting warm out and it will get warmer! 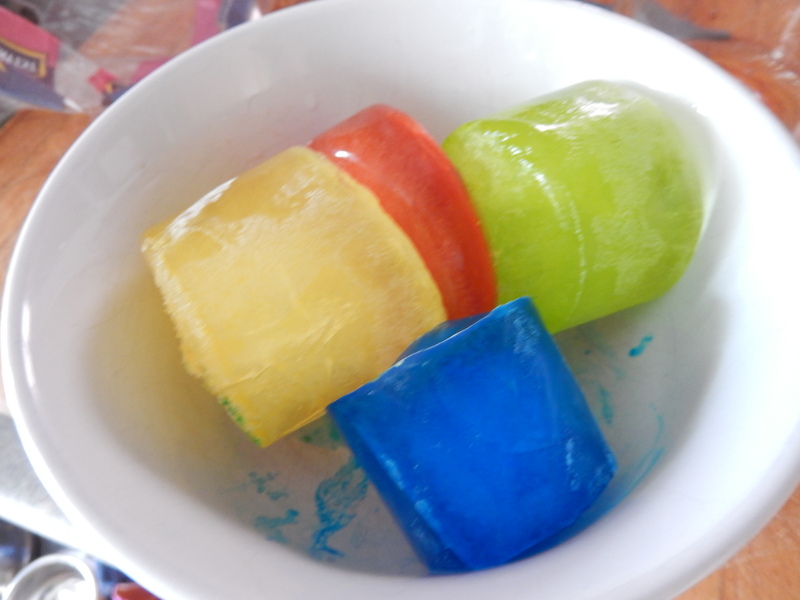 Cool down with some coloured ice play! What a great way to bring the fun of the beach home with you! Want to squeeze in some learning while you are at play? Check this out! I hope we have been able to help inspire you today, I know we will be having a lot of fun with our water table this summer, we would love to hear some more ideas or feedback, thanks for joining us at excite and explore! 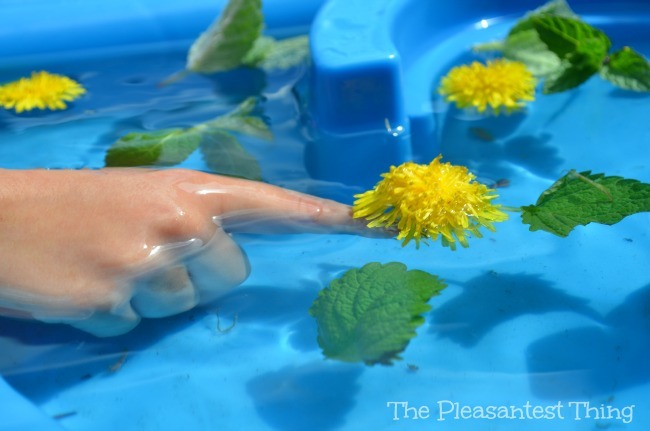 Categories: Fresh Air Fun, Fun at Home, Sensory Exploration | Tags: sensory play, summer, toddler activities, water table | Permalink. This weekend we are learning about the letter B in our home! We started of our morning with our letter B Themed Bin (or should I say pie tin!) and explored things that start with the letter B! 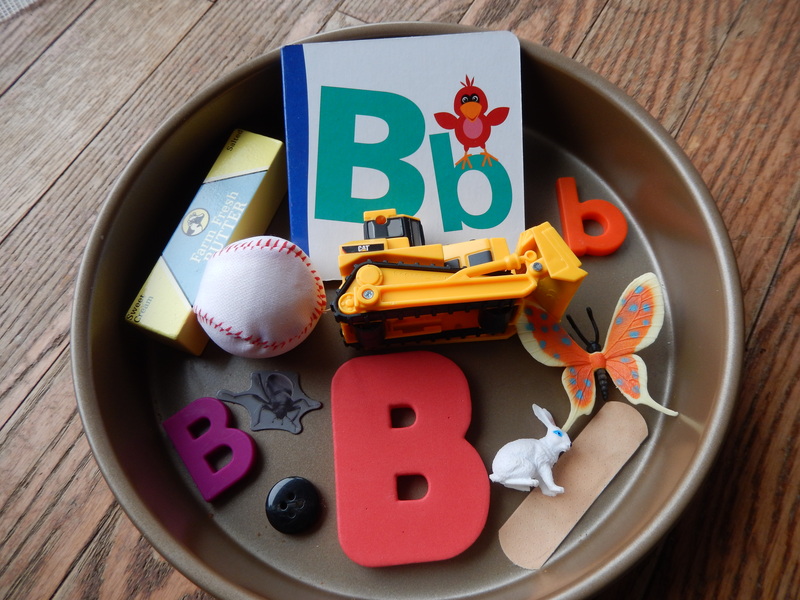 We explored and read the letter B book, and examined a baseball, a Band-Aid, a bulldozer, a little plastic butterfly, a bunny, a button, a beetle and a play food stick of butter. The little one caught on to the ‘b’ sound pretty quickly, it is an easy one for him to say. 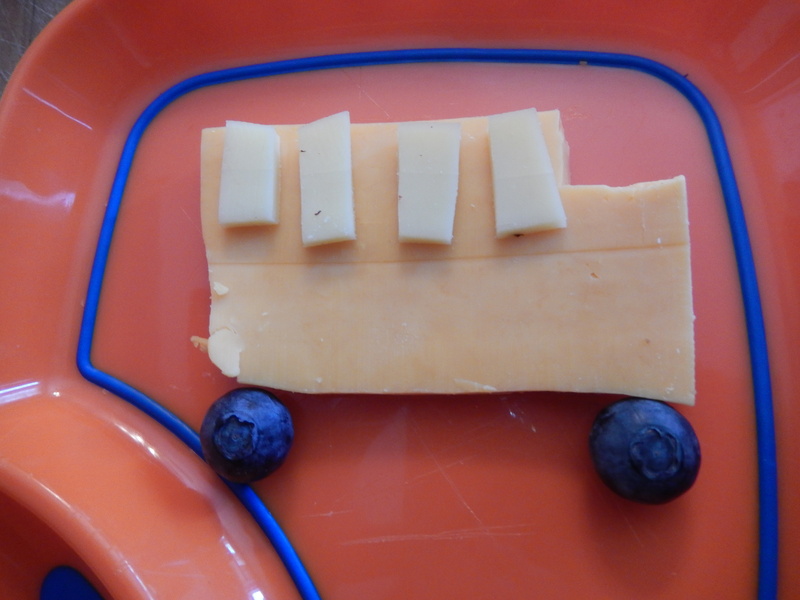 When snack time came around he was delighted to see one of his favourite things made out of cheese and blueberries, a bus! After nap we went on a bug hunt! 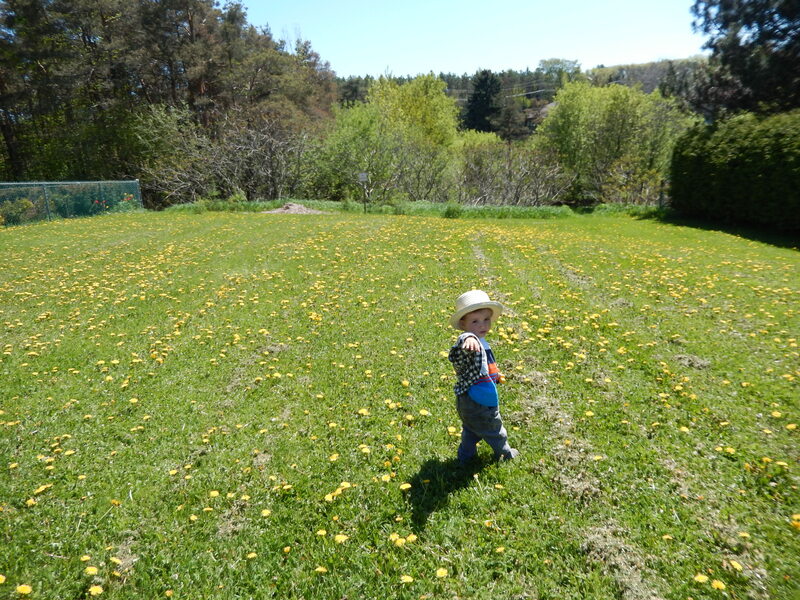 There is a huge field near our house full of dandelions, so naturally it is a haven to bumble bees so we popped on down to observe. I was a bit hesitant at first, since Gray has never been stung and I’m not sure If he is allergic, but we have no family history of it, so I decided it was okay, besides he loves dandelions, so once he saw the field there was no keeping him out! We went on down and saw quite a few flying fuzzies, which I was sure to explain we could not touch. Then we headed down into the gully to hunt for bugs. 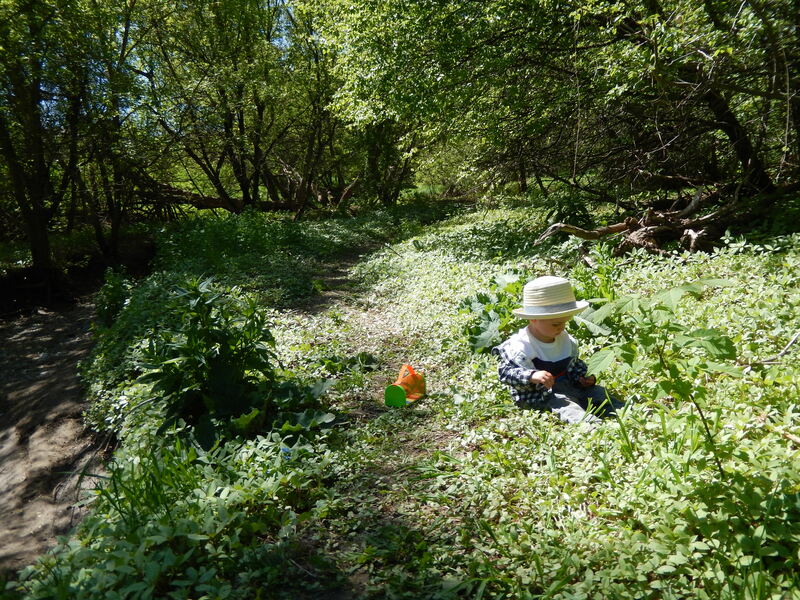 It is a beautiful little spot with a stream, lots of plants and some trees and a little field. 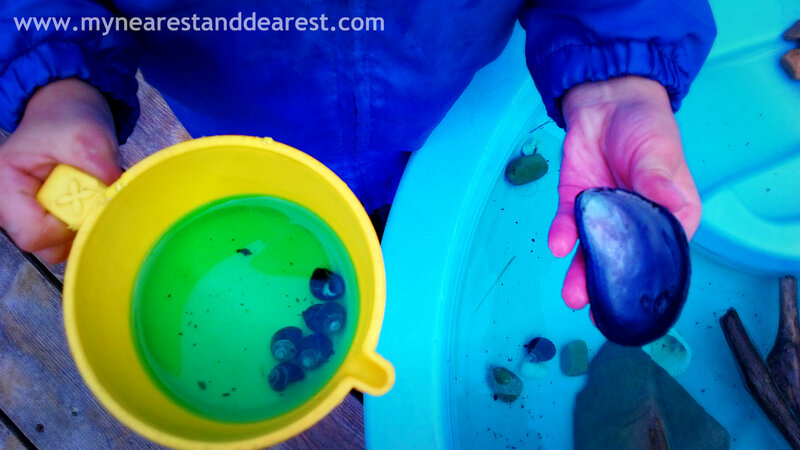 We found lots of snails, which Gray carried around for the rest of the trip. Of course we talked about how bugs starts with the letter B, and we managed to scoop up some beetles and a June bug as well. After our little nature walk we released our little friends and came back home for one more letter B activity, bulldozer painting! This was inspired by an awesome post I saw on Fun At Home With Kids about using toy cars to paint. Gray loves his bulldozer and it has some pretty cool treads, so I figured, why not? 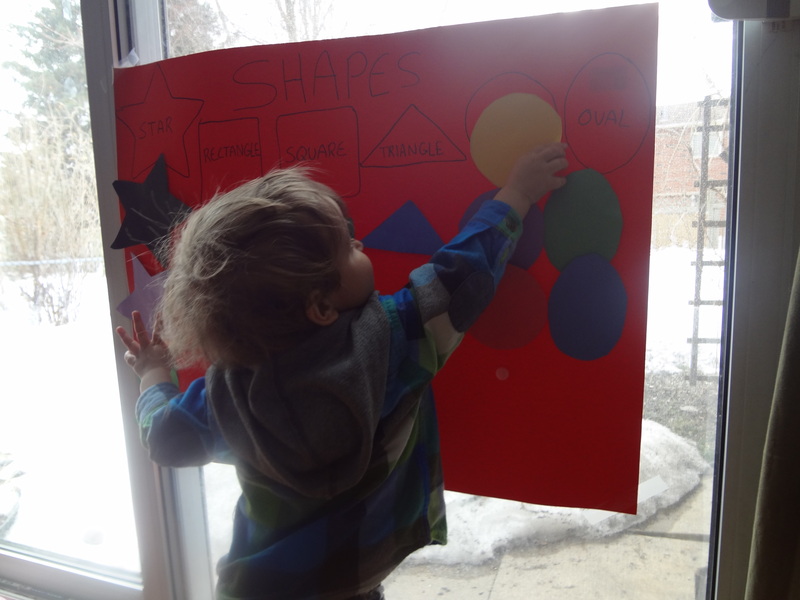 Gray is almost 2, so art activities need to be pretty simple and easy to do or he will have no interest in it, this activity was perfect, it was art and play at the same time! 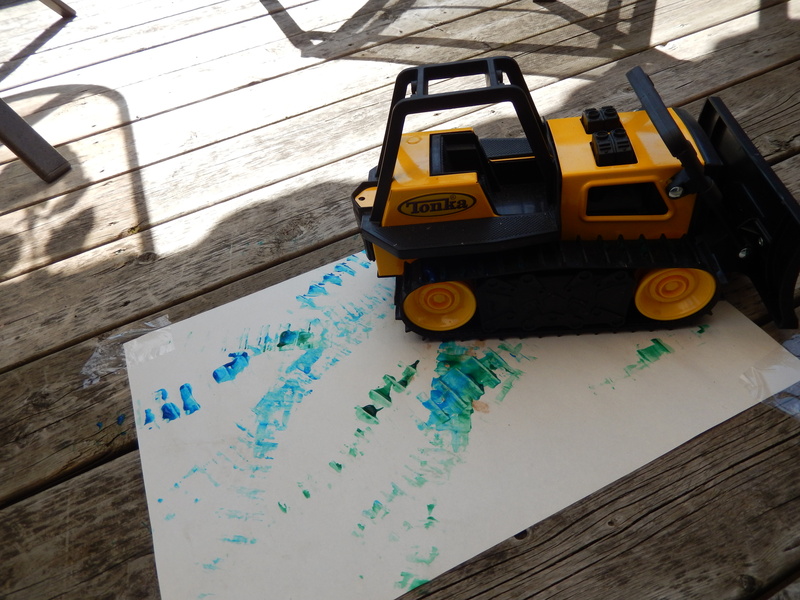 I would call our letter B weekend a success, now when he sees the bulldozer he points to it and makes the ‘b’ sound, and for now he seems to be able to identify it by sight. Sorry this post is a bit late going up, we have been putting in a vegetable garden this weekend so we have been pretty busy! We would love to hear some feedback or your ideas for the next letter, thank you for joining us at Excite and Explore! 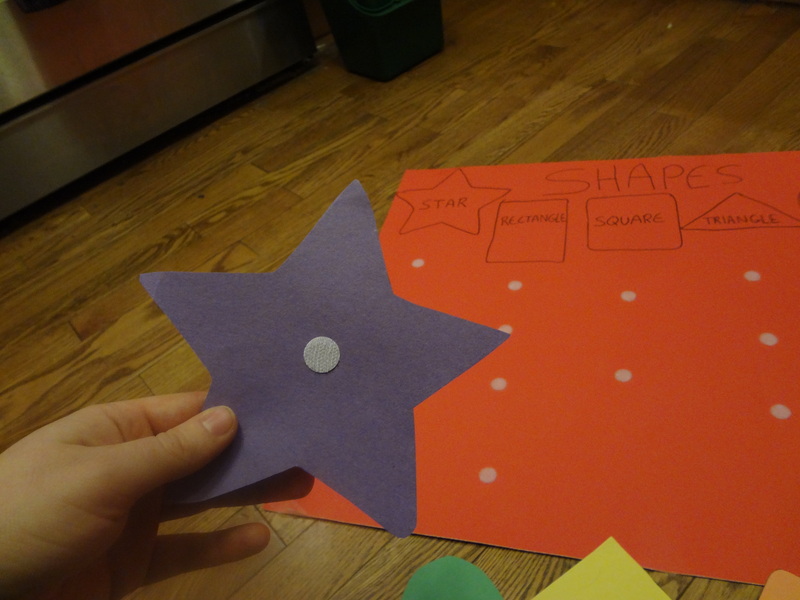 Categories: Fun at Home, Learning The Alphabet | Tags: Craft, Letter B, Toddler Activity | Permalink. 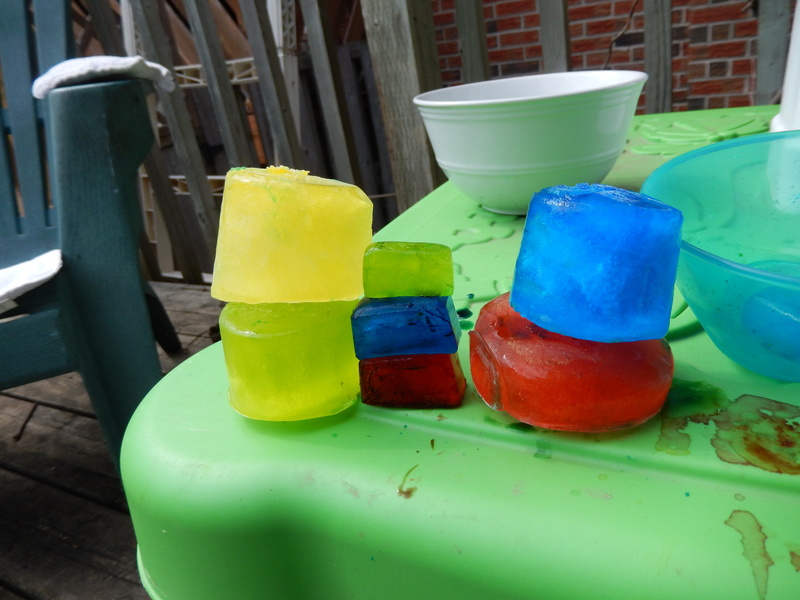 So recently I saw this neat post on Learn Play Imagine about coloured ice play and I thought we would give it a try and share some ways to play with coloured ice. 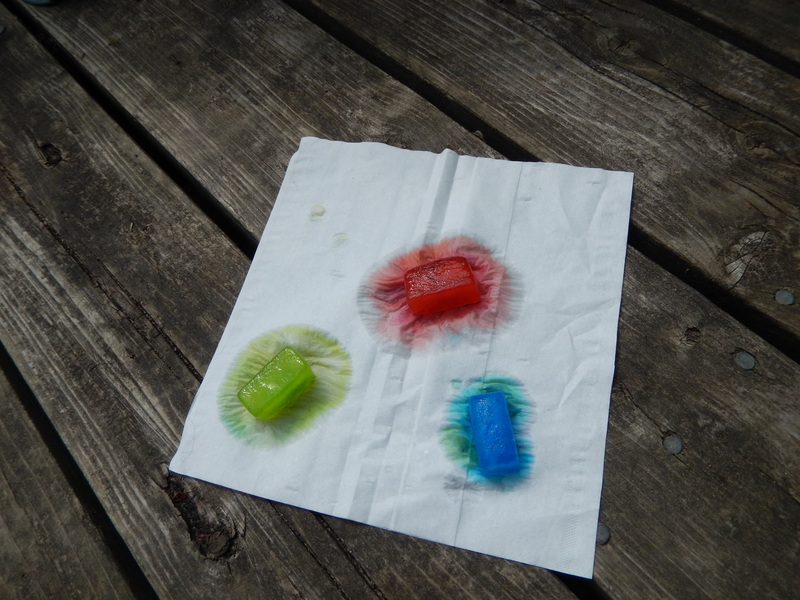 It is really easy to make, and we used the put the food colouring in the ice cube tray before water method, which left us with really nice, evenly coloured ice. 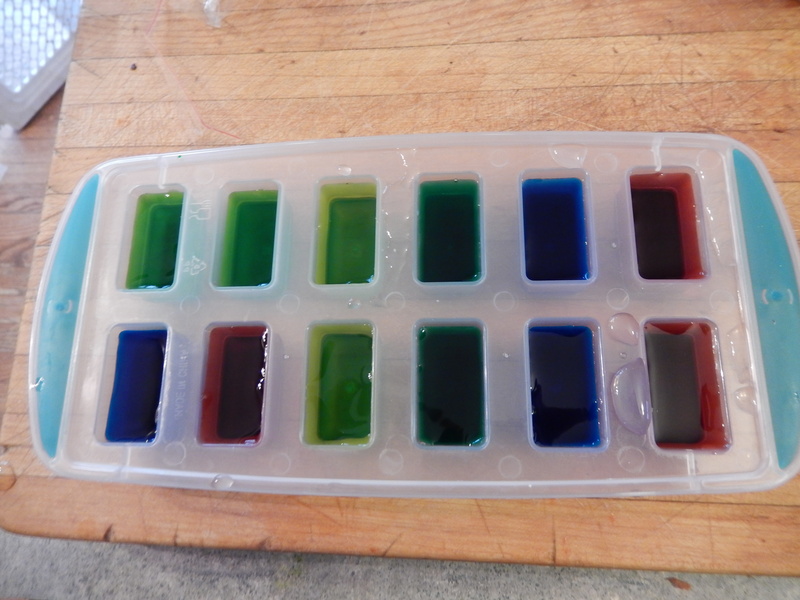 I put two drops of food colouring for each ice cube and added water. 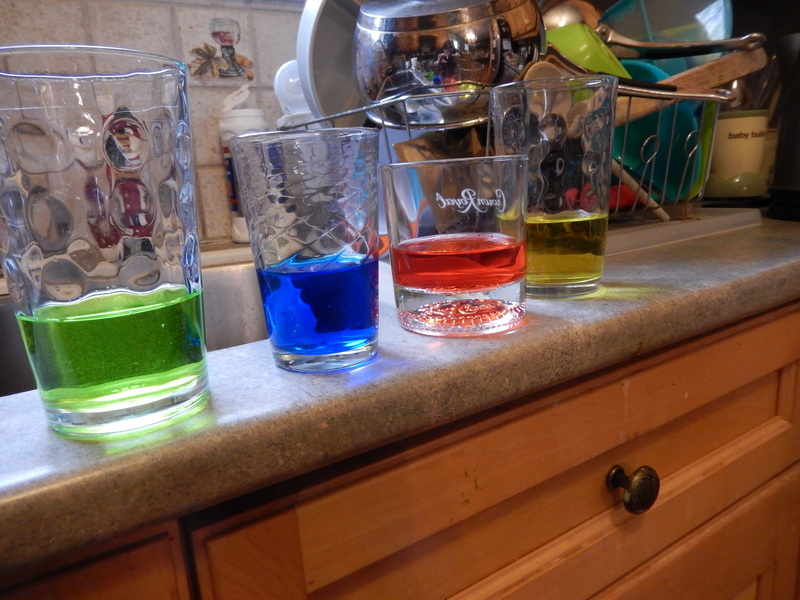 I also made some bigger pucks using more food colouring and some glass cups. 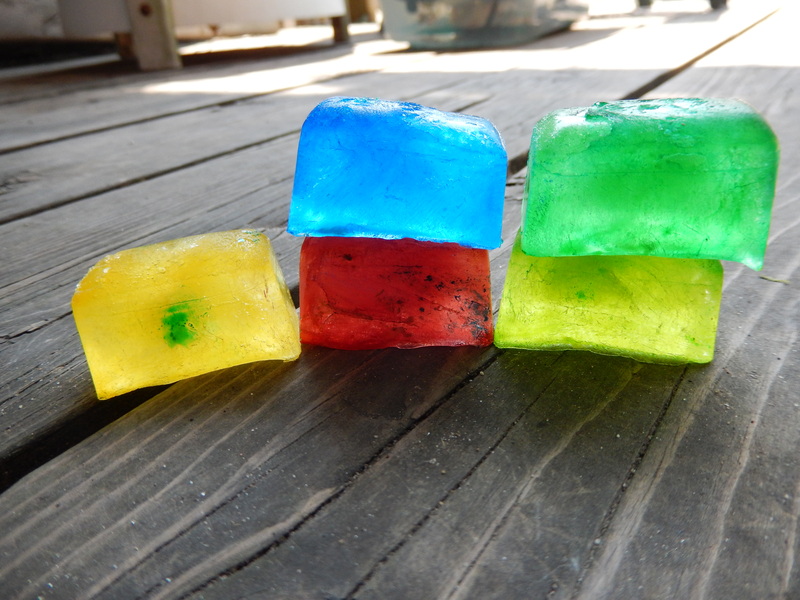 I left the cubes in a bowl by the water table and released the toddler, after stripping him to his diaper and a hat since I wasn’t into scrubbing food colouring out of his clothes. He was really curious as to what exactly these were, so in typical small child fashion he tried to eat them, but once he discovered that they weren’t anything special he started off by using them as building blocks, which was quite the challenge since, being made of ice, they were pretty slippery and slightly rounded from the mould. I dubbed this our castle. I had a sudden thought and brought out a Kleenex and we put three different coloured ice cubes on it and left it on the deck to melt. 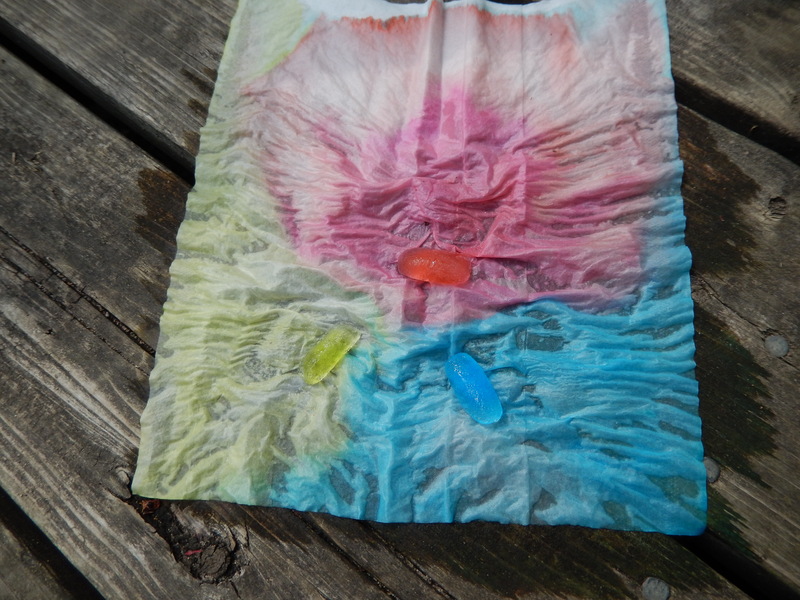 Which melted into this really cool tye-dye like piece, that we hung up to dry in the sun. 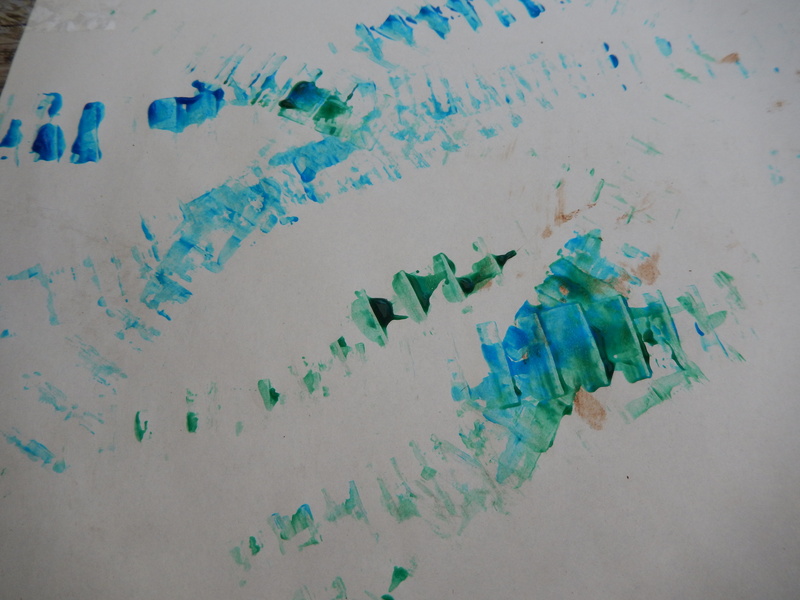 Then they went into the water table, swirling around and colouring the water. This was all done in-between attempts to eat the ice cubes, since he seemed convinced that they would taste different than the last time. That was our adventure with coloured ice! We would love to hear your ideas for playing with this cooling activity, thank you for joining us at Excite and Explore! Categories: Creative Crafts, Fresh Air Fun, Sensory Exploration | Tags: Activity, coloured ice, fun, Sensory, toddler play | Permalink. Today we started a new series called the Letter of the Week! Gray has recently started showing an interest in learning his letters, when he see’s one he points to it, inquiring what it is called and has started identifying them (admittedly he only knows B, H and R on sight now but hopefully by the end he will know some more) and repeating what they are called when I tell him. So now every weekend we will feature the next letter in the alphabet and share some activities and crafts we did that day. 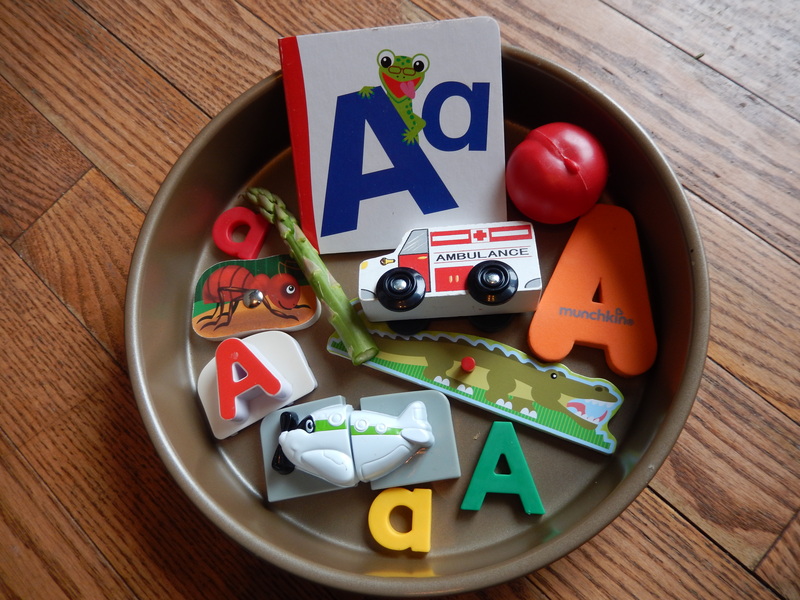 We started off the day with a little display I made in a cake pan full of things that started with the letter A, a book and some small examples of the letter A. Ours had a small plastic apple, a spear of asparagus, a wooden ambulance, an alligator, an ant, and an airplane. 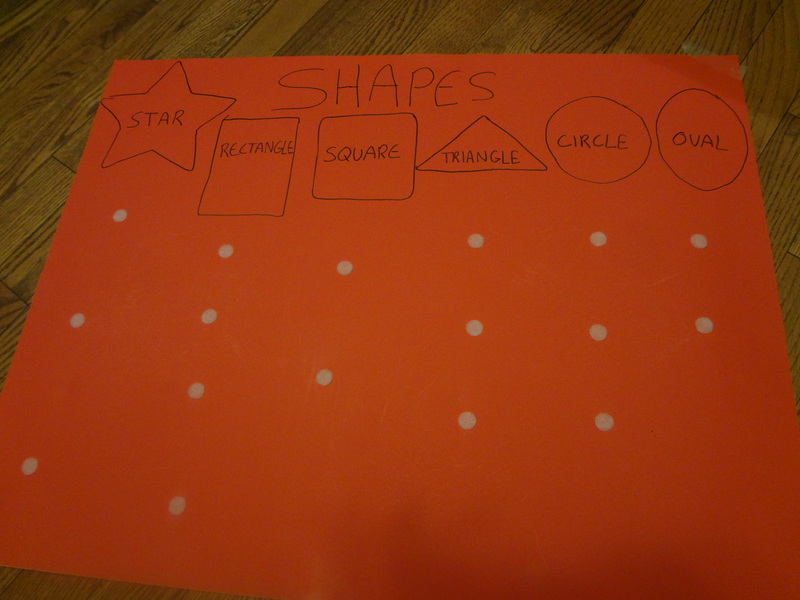 As he explored it we discussed the different objects and sounded out the words, emphasizing the A sound. 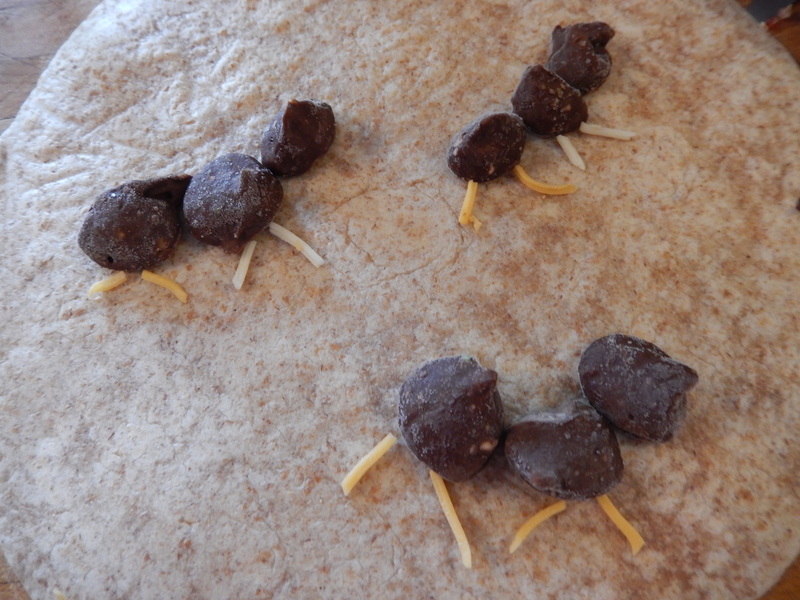 For snack we had chocolate Avocado nibs, a recipe he adores (and so do I) that can be found on this wonderful blog called Cheerfully Imperfect which I made into little Ants using cheese for legs on a pita. After nap we did some stamping with a homemade stamp I made out of an apple. 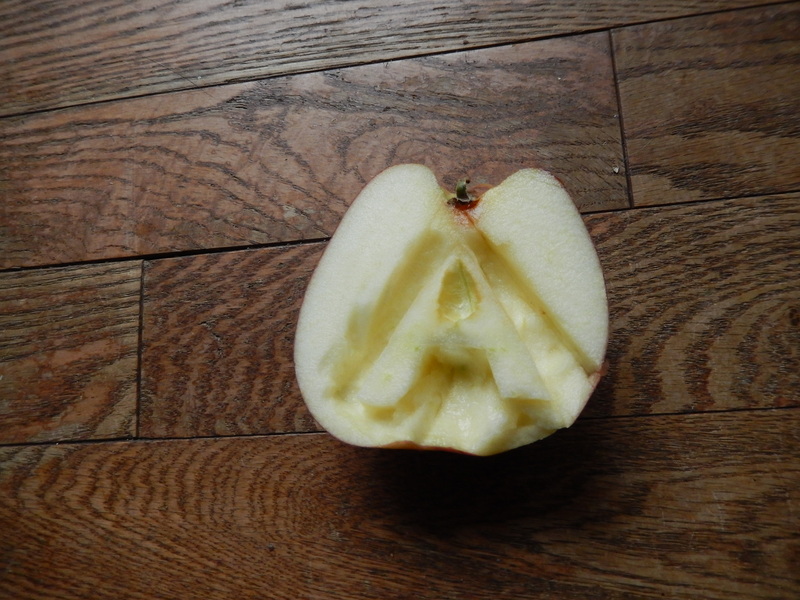 It was really simple to make, I just carved the letter A in half of an apple (I’m pretty sure a potato would also work) with a knife, using the apple seed divet as the hole in the A and stored it in an airtight container overnight so it wouldn’t get all mushy. 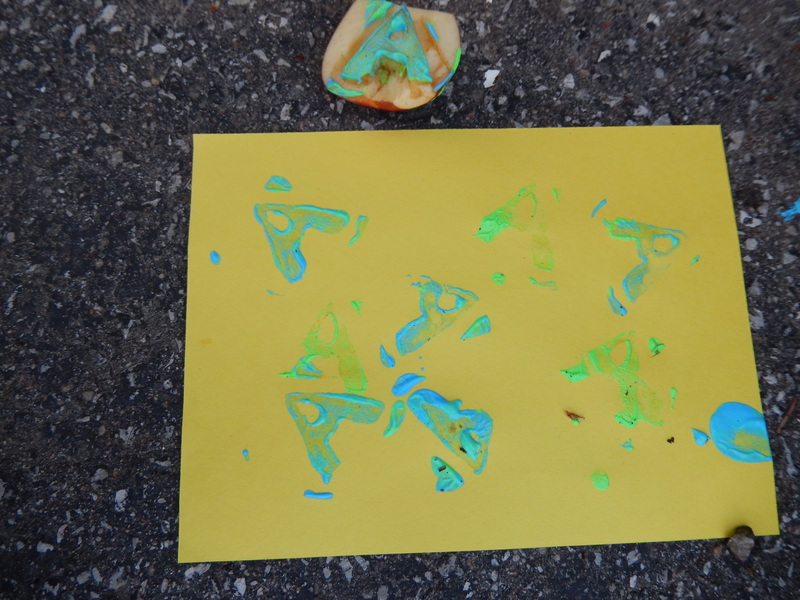 I poured some paint onto a paper plate and we stamped the apple into the paint and onto a piece of construction paper, Gray really likes stamping so we tend to do this a lot. This was his picture. 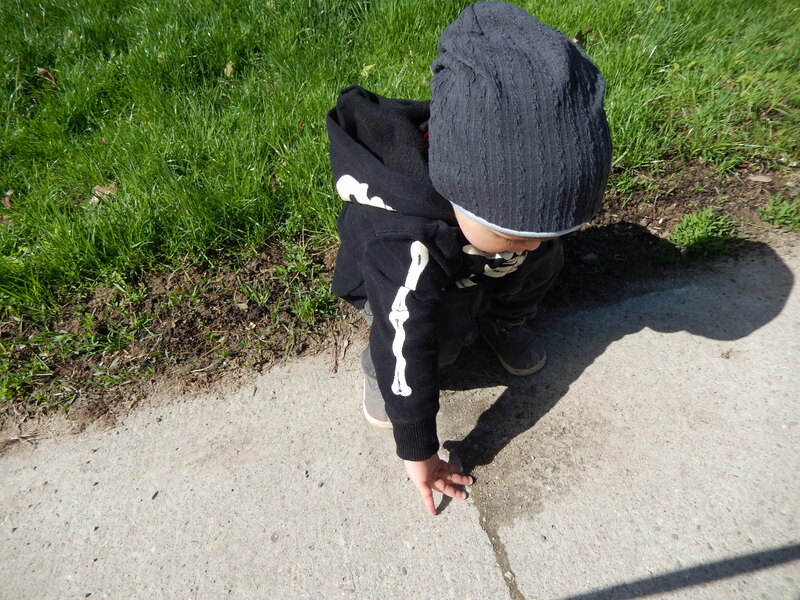 We finished off our day of observing some ants outdoors and looking at their ant hills while I explained how they make tunnels underground ( I’m fairly certain he didn’t quite understand this but he seemed to be interested.) all the while emphasizing that Ant starts with the letter A. That is all for our day learning about the letter A, feel free to join us again next week as we explore the letter B, and thanks for stopping by Excite and Explore! Categories: Creative Crafts, Fun at Home, Learning The Alphabet | Tags: Alphabet, B, Craft, Toddler | Permalink. What a time of the year! The weather is lovely, the flowers are blooming and it isn’t boiling hot out yet! 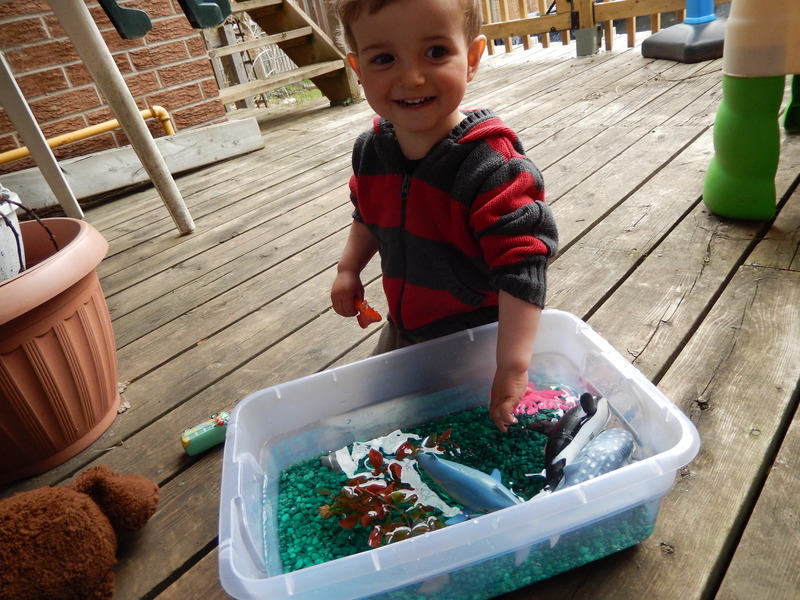 It has been really warm however, so to cool down a bit I whipped up a fun Under The Sea Sensory Bin for the little man to play with out on our back deck, incorporating some water play and imaginative play with a fun sensory experience. This is a really easy bin to make, it took maybe 5 minutes to whip up and has provided hours of entertainment so far. 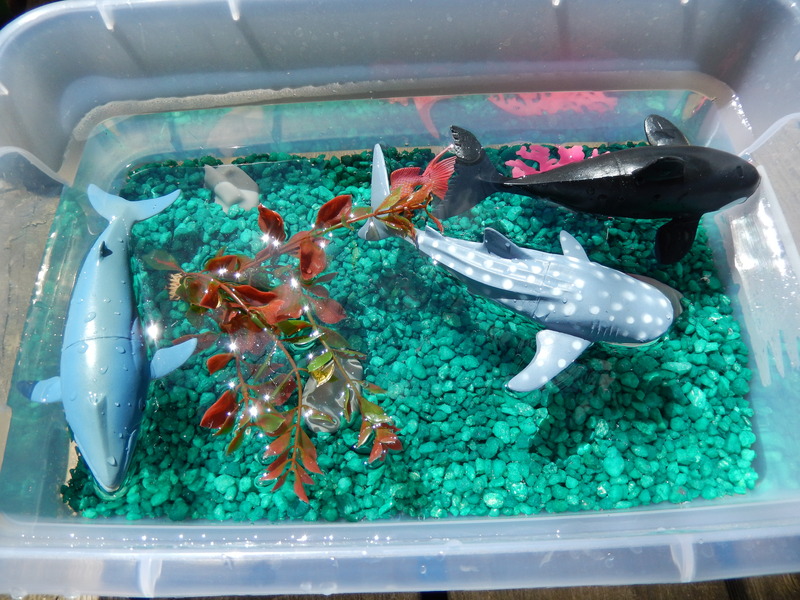 I used the small rock/gravel you put on the bottom of fish tanks that we had left over from my sons fish tank ( Grandma took him to the pet store to ‘look’ at the animals and when they came home they had a small friend. ) some rocks and plastic coral as well as a fake plant also meant for a fish tank. 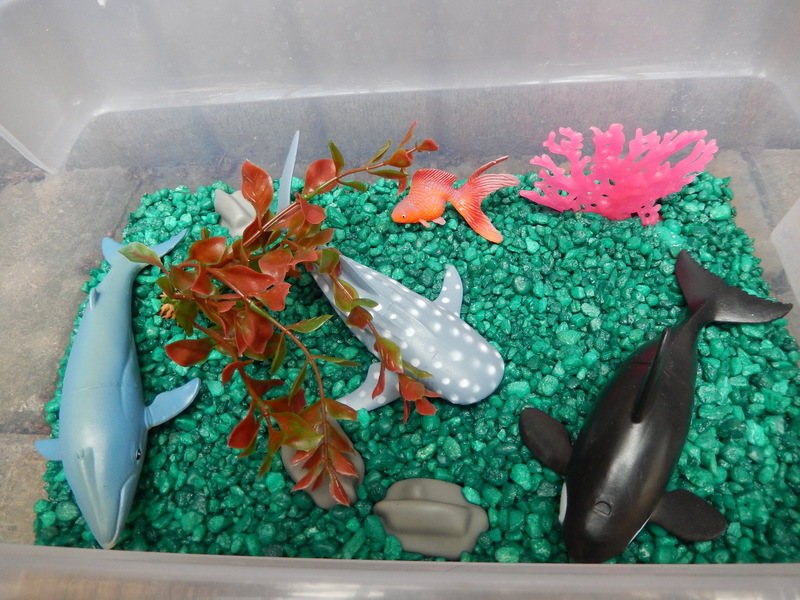 I added some plastic underwater animals such as fish and whales to the bin and it was ready to be filled up. I filled it up with water from the garden hose and it was ready for little hands. As he explored the new bin we chatted about the different animals in the bin and I named them as he held them up for inspection. He really liked the gravel, it was something new for him to dig through and feel and of course there were lots of splashes. I’ve been keeping this bin outside simply because the weather is nice enough for it and that way there is little mess to clean up once he wanders of to do something else. That is all for today folks, thank you for joining us at Excite and Explore! 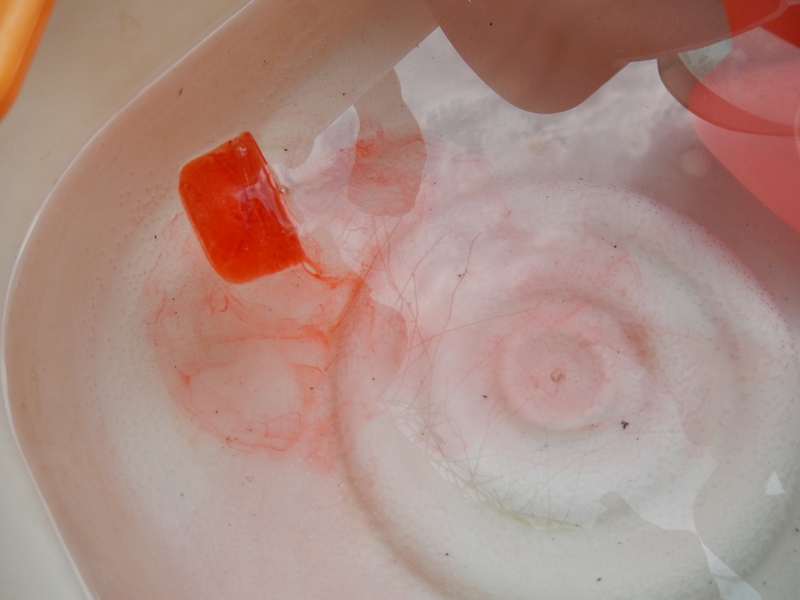 Categories: Fun at Home, Sensory Exploration | Tags: Sensory Bin, Toddler, Underwater Play | Permalink. Yesterday was a lovely day out and we spent most of it out in the sunshine and fresh air. I was talking to Gray about the different seasons and how excited I was that spring has arrived. ( Honestly here it really has just arrived, the snow is finally gone and I no longer wake up, look out the window and fight the urge to cry at the thought of scraping of the car.) 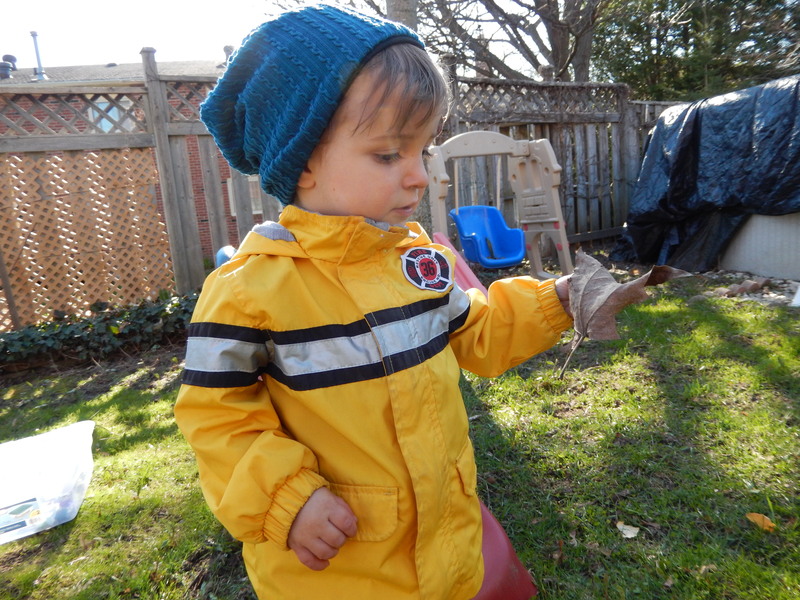 Gray has recently decided that soup isn’t so bad after all, when for the first year and a half of his life he detested the wholesome goodness that is soup, so I thought we would do some pretend play out in the back yard. Best of all this activity is free! (Provided you have something at home you don’t mind using as a pot.) 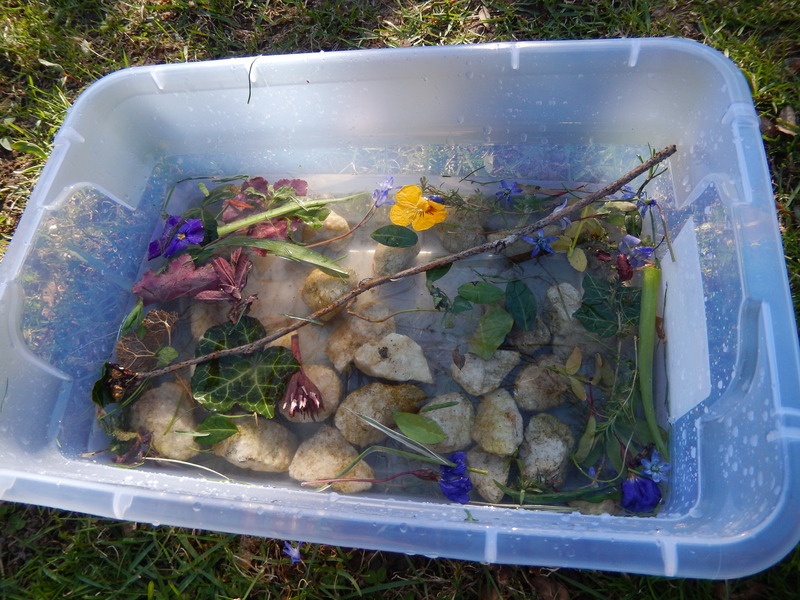 I emptied out a small Tupperware bin and brought it out back with us, and we went around the yard collecting things that reminded us of spring. ( or in Grays case whatever he felt needed to go into the soup pot. ) We placed it all in our soup bowl and added some water from the hose. Soon he grabbed a stick and was stirring the soup after every ingredient he added and pretending to drink it with a leaf spoon. The he discovered that rocks make a big splash when added to our delicacy so in went handful after handful of rocks. 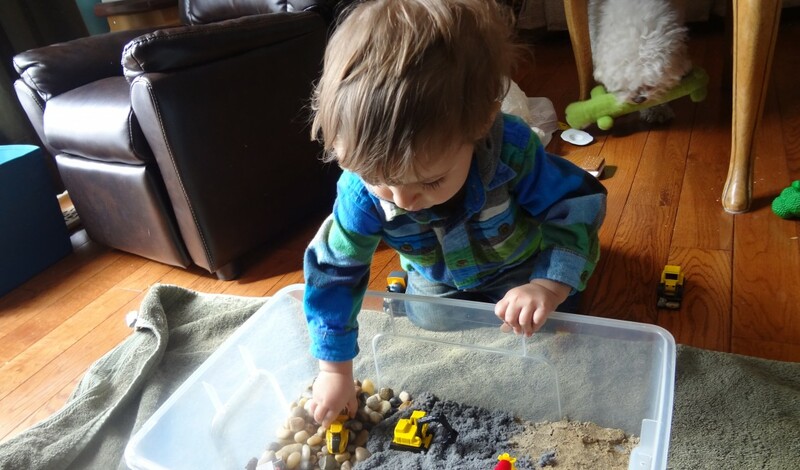 We had a great time doing this and I am always trying to find new ideas for imaginative play, I find that he struggles a little bit with it sometimes but this activity went off without a hitch. What do you like to do to welcome spring? 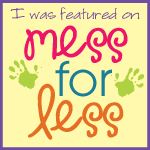 Categories: Fresh Air Fun, Fun at Home | Tags: imaginative play, Spring, Toddler Activity | Permalink.